As part of APA's long-term partnership with both government leaders and non-governmental organizations in China, the AICP Commission is responding to interest in promoting the credential to planners in China. One of our partners is the State Administration of Foreign Expert Affairs (SAFEA), which certifies APA to conduct training for Chinese officials including support for our long-running mayors training program. SAFEA believes that Chinese planners are interested in the AICP credential as it represents a broader and in some ways, more international approach to planning. China has its own type of certification but it is focused more on the specifics of the Chinese regulatory framework than broad planning principles. Currently there are 83 APA members in China, of which 24 are AICP. With a pilot strategy to promote the AICP credential in China, APA should see an increase in membership in China while broadening APA and AICP's influence and implementing one of the fundamental elements of our Charter: promoting the art and science of planning. Under the pilot effort, there will be no change in the exam, the application review process, or any other aspect of the current program, including certification maintenance requirements or ethical standards. The pilot program will primarily work on building more focus and awareness through our partners. The commitment of AICP resources in the pilot program will be limited, with the bulk of the work being done by our partners. In addition to Chinese planners already practicing, there are hundreds of Chinese students of planning graduating from American PAB-accredited programs every year. Many of them are interested in pursuing AICP, as well as practicing in their home country. The general globalization of planning coincides with the rapid urbanization that is continuing in the 21st century. The AICP credential is well positioned to play an important role in promoting standards of practice, professional development and ethical behavior. The Chinese see value in all these elements of the partnership with AICP. Over the next year and a half, the pilot program approved by the Commission will provide more awareness of the certification and we will work with our partners to provide exam preparation training appropriate to the culture and evaluate the initial results. Based on this effort, we can consider the ways in which our organization can respond to the global demand for professional planners and help ensure both useful credentials as well as encourage ethical practice. APA has been collaborating with our partner, Zhejiang University, on an effort to use cultural and historic resources as the basis for an economic and community development strategy. Zhejiang also contracted with Design Workshop to undertake the visual and resource analysis and development of design guidelines. The draft report, largely in Chinese with some English and many illustrations, is available here. Contact Jeff Soule at jsoule@planning.org for more information. Image: (front, from left) James Drinan, Biao Nie; (standing, from left) Fang (Andy) Yuan, Yuan Liu, Jeffrey Soule, Sun Zhaohua, Haiyang Wang, Zheng Jie. Mr. Sun Zhaohua, Deputy Director General of the State Administration of Foreign Expert Affairs (SAFEA), and Mr. Biao Nie, Director of the China Association for Intellectual Exchange of Personnel (CAIEP), visited the Washington, D.C., office of APA on November 19, 2014, to expand APA's long-term relationship with the agency. Since 2002, SAFEA has certified APA as a recognized training organization that can host delegations of Chinese officials for training in the United States and also conduct training in China. The agency is responsible for certifying organizations outside of China and also provides funding for delegation travel. APA Executive Director James Drinan, JD, thanked the organization for its support of the APA Training Program for Chinese Officials and for its certification of APA as a qualified educational provider. He went on to express his hope that APA would be the best partner for SAFEA and offered to further cooperation and partnership. APA Director of Outreach and International Programs Jeff Soule, FAICP, added his thanks for SAFEA's long and valuable support to help promote APA's training program and for their participation in many of the delegations. He noted that APA has several other types of programs provided domestically that may also be transferrable: Community Planning Assistance Teams (CPATs), Planners Training Service workshops, and specific advice to places by APA members. Director Sun responded that they will reach out to various ministries including environment, development and reform, and land and resources as well as provincial and local officials to promote APA experts providing assistance to China. Mr. Sun expressed SAFEA's pleasure in signing this new MOU which adds to the existing partnership an additional effort to send more APA experts to China. He also expressed continued interest in promoting the AICP credential and said that the SAFEA's training center was well-positioned to provide both the online version and face-to-face exam preparation programs. Both sides agreed to communicate their discussions with the AICP Commission to pursue the joint promotion of the credential. They expect to meet again in the second or third quarter of 2015. After hosting nearly 1,000 Chinese mayors over the last decade for training on urban planning, the American Planning Association's partners from the Chinese central government are interested in expanding this professional exchange by inviting experienced American planning experts to China for short-term technical assignments requested by local government. China's State Administration for Foreign Experts Affairs (SAFEA) is working hand in hand with APA to establish an "American planning expert pool." SAFEA is particularly focused on members with the AICP credential. They will collect professional assistance requests from Chinese local government, organizations, and the private sector and forward them to APA. Then APA will suggest several AICP planners from the expert pool for consideration by the local hosts. Travel expenses and stipends for planners selected will be covered by our Chinese partners. Most assignments will be around two weeks. China is planning for another phase of rapid urbanization, which will move nearly 300 million people into urban areas. This trend represents a great opportunity for APA members to share knowledge and build on our international collaboration. If you are interested in being part of this program and exploring opportunities in China, please briefly summarize your professional background, specialties, and interest in China, along with a resume or C.V., and send them to training program manager Andy Fang at yfang@planning.org. Mr. Wang Shi (right), founder and chairman of Vanke, China's biggest developer, visited Washington, D.C., from July 10-18, 2013. APA hosted the guest and his entourage for discussions of urban policies and visited a series of related partners, including Department of Housing and Urban Development, Woodrow Wilson Center, and Ginnie Mae. APA kicked off 2013's international leadership training program by welcoming 23 mayors and party secretaries from Shandong province this summer for 21 days. Cities visited were Washington D.C., Baltimore, Boston, New York, and Los Angeles. The mayors learned about American government structure and urban planning, comparisons of American and Chinese ideas of "urban design" and "urban planning," regional planning and intergovernmental cooperation, public participation and planning process, and green community. Other study topics for the mayors included the Monument Core Framework Plan, America's land use and zoning, capital improvement plan, Urban Growth Boundary, and urban rail systems. Invited by Chinese Ministry of Land and Resources as well as several cooperative organizations in China, APA's Executive Director W. Paul Farmer, FAICP, and APA's President Mitchell Silver, AICP, visited China for a week in mid-November 2011. The trip started in Hong Kong, where Executive Director Paul Farmer made a speech on "Resilient City" at the MIPIM conference, the world's leading real estate exhibition and conference. Soon after the conference, Farmer and Silver visited Mrs. Barbara Finamore, the China Program Director for Natural Resource Defense Council (NRDC). After an informative discussion on viariety of urban issues, a framework MOU is signed by both parties for future collaboration on promoting sustainable urbanization initiatives in China. The second stop of the visit was Shenzhen, a rapidly growing Chinese city that transformed from a fishing port into a megalopolis in just 30 years. As the main host, Eddie Tsui, Jack Hsu, Thomas Tang, and others from the AECOM Shenzhen office warmly welcomed the APA guests and organized a series of discussions and lectures with local planning department and NGOs. Mitchell Silver's speech at Shenzhen Center of Design was well received. Following the Minister, Mitchell Silver's speech discussed lessons and experiences of rural development in the U.S. while Paul Farmer spoke about APA's international initiatives and programs regarding land conservation under the challenge of climate change. At the capital city, Beijing, Farmer and Silver experienced traditional Chinese city planning philosophies through an exploration of its central axis from the Temple of Heaven, the Forbidden City, to the Drum Tower and the Bell Tower. The trip ended with APA members and friends at a restaurant restored from the former American Legation during the Qing Dynasty yards away from Tian'anmen Square. In November 2010, the Shuozhou government invited APA to conduct strategic development research with the goal of helping Shuozhou make the transformation from an energy-consuming city to a more sustainable one, and improve the environment. Because Shuozhou is one of the major energy hubs of China, with about one-sixth of the nation's coal production, we recommended "low-carbonizing method" to achieve its goal while maintaining high energy production by restructuring its urban built environment and diversifying its economy. APA China Program suggested that Shuozhou carefully calculate its greenhouse gas emissions from major industries, adopt carbon reduction technologies, and strengthen its afforestation works. It would be a good idea to make plans in advance for the upcoming carbon trade system in China. The China Program is planning to launch a multi-organizational seminar with representatives from U.S. Environmental Protection Agency, U.S. Department of Energy, and the U.S. Department of Commerce to discuss this issue in December 2011. As a major textbook for APA China Program's training program, this 30-page Chinese language booklet briefly introduces American planning history, classic landmarks, important cases studies and stories, and new trends. APA China Program completed the final editing in the summer of 2011. Coming soon: With help from APA's unofficial student organization, Chinese Young Planners Network (CYPN), APA China Program has been working on a portfolio book of demonstration projects in China to introduce APA's experience in China. The final book is anticipated to be completed by early 2012. APA started a relationship with Nantong city in 2005 when the China Program was invited for a strategic research project. Over the years, Nantong has been following APA's suggestions on harnessing its sprawl and promoting compact urban nodes. In 2011, Nantong representatives came to the U.S. hoping to bring back some ideas for a new town near the Yangtze River. APA China Program brought them to New Orleans to check out the port planning and flood control issues, then to Houston to see how much it would cost to fix a planning mistake. The Canadian Institute of Planners arranged a lecture on the waterfront redevelopment of Toronto. The trip ended in Chicago with a discussion on the relationship between design guideline and historic preservation. With their "new garden city" vision in minds, Chengdu mayors focused on the sustainable issues and rural developments during their 16 days of training in the U.S. in 2011. They were deeply impressed by some of the small town developments such as Riverside, Rehoboth, and Easton. Sustainable issues on water management and farmland preservation also stimulated extensive discussions among delegates. After the training session, the mayors invited APA to visit Chengdu and give lectures to larger audiences, and discussed potential for further exchange and cooperation. As part of APA and Chongqing's perennial cooperation program, the Chongqing planning bureau made its fifth visit to the U.S. During the training, these professional planners obtained in-depth insight of American planning experience. They paid special attention to the practices of form-based coding as well as urban design guideline, and compared it with Chinese standards and guidelines in shaping city character. The bundle project started in the end of 2009 with a regional strategic research for Nanjing's Liuhe district, a heavily polluted industrial center cross the Yangtze River from the historic Nanjing. The APA team recommended corridor solutions to repairs its urban center in the west, and suggested smart growth pattern for its pristine countryside in the east. Upon the completion of research, Liuhe government invited APA to continue the consulting service to work on the two new towns identified by APA team as the potential development nodes: Golden Ox Lake, a resort TOD new town with "healthy city" theme, and Longpao, a pilot low carbon new town experiment. On April 9, 2011, as part of APA's National Planning Conference in Boston, young adults from the U.S. and China came together to discuss the involvement of younger generations in the cities of tomorrow. APA's people-to-people dialogue brought together young trendsetters from the two biggest influencers of world urbanization to express their thoughts about the future. Following the unconference concept, the six keynote speeches at the "International Forum on Sustainable Urbanization for the Next Generation" were interspersed with impassioned roundtable discussions and debates over issues that included social media and creative ways of participation, values and functions of future cities, decision making with the help of data, and types of innovative urban forms and lifestyles for the future. Always remember our dreams today! APA welcomed a second wave of mayors from the Chengdu metropolitan area on May 4, 2011. During their 16 days of training, the mayors visited Washington, D.C., New York City, Chicago, San Francisco, and a group of small towns that included Easton, Maryland, Rehoboth, Delaware, and Riverside, Illinois. The delegation paid close attention to the issues of rural town planning, sustainable development strategies, urban design in conjunction with land use, and urban redevelopment case studies. Jeffrey Soule, FAICP, APA's director of outreach and international programs, accepted the mayors' invitation to visit Chengdu in the summer of 2011 to strengthen cooperation between Chengdu and APA. In September and October 2010, APA's China Program welcomed a large number of training delegations from China, totaling 62 delegates from Chongqing, Wuxi, and Chengdu city (mostly Mayors and Chief Planners). Each of the three training tours spent two to three weeks traveling from coast to coast and participating in lectures, on-site teachings, discussion panels, and public hearings. The training content was extensive and covered almost every aspect of American planning, from government and taxation, intergovernmental cooperation, public participation, to green community, land use policy, form based codes, and capital improvement planning. The delegates are especially interested in the comparison between American and Chinese planning perspectives, successful case studies, and the mistakes American planners have made in the past decades. Five Chinese planning students and young professionals were chosen from the Chinese Planning Student Network (CPSN) candidates to participate in the training tours as team leaders and interpreters. When former Nanjing Mayor Li Yuan Ciao attended Harvard's program for new officials in early 2001, it changed Li's perspective on cities and city planning. Since that time Mr. Li has gone on to become one of the fast rising stars in China, now the Secretary of Personnel for the Chinese Central Government, a member of the leadership of the country, and an important ally for APA in China. He was also responsible for championing APA's successful mayors' training program and to partner with APA as advisor and collaborator on the future of Nanjing. Nanjing is the capitol of the most rapidly urbanizing province in China, Jiangsu Province, and was the capital of China on nine different occasions over the last two millennia. With the recent appointment of Secretary Zhu Shan Lu to lead Nanjing, APA's relationship with the historic city has been renewed through 2013. APA provides advice and consultation, with funding, on a variety of issues that act as an urban laboratory for other Chinese leaders and cities which share many of the same issues. This year APA invited former Portland Planning Director Gil Kelley, AICP, to provide advice on the planning and development of a new science and technology village, using a live work model like the one he spearheaded in Portland on the waterfront. In addition, to aid the city in preparation for hosting the Youth Olympics in 2014, APA in China asked Alan Fujimori of Belt Collins to join a field team to make recommendation on plans for the event and for a long-term regional cultural and ecological tourism strategy for the Liu He District of Nanjing. Belt Collins is among the dozens of US planning and design firms who have participated in APA-sponsored training workshops to help them engage the Chinese market and participate in programs. APA specifically reaches out to members when opportunities arise for showcasing our planning philosophy and mission of building global partnerships. Under a grant from the U.S. Commerce Department from 2005 to 2008, APA was able to generate tremendous interest and build awareness of U.S. planning and design expertise. APA is planning the next Planning in China workshop for 2011 in Chicago. Details will be posted when the program is set. In addition to this workshop, we will have a session at the 2011 National Planning Conference in Boston, describing in more detail APA's planning efforts in Nanjing that are applicable to U.S. situations. The United Nations has reported rapid urbanization in China, which is undergoing a major transformation of its urban structure and a "rapid increase in the number of cities with sizable population." The report was contained in the 2009 Revision of World Urbanization Prospects, issued March 25, 2010. It says the urban surge in China reflects economic growth and internal labor movements. "China alone has 25 percent of the cities with at least half a million inhabitants," said the UN report, compiled by the Population Division of the UN Department of Economic and Social Affairs. "The country is undergoing a major transformation of its urban structure," the report said, noting that the number of cities in China with at least half a million inhabitants has increased markedly since the 1990s. "In 1980, China has only 51 cities of that size," the report said. "Between 1980 and 1995, another 51 were added to the group and, between 1995 and 2010, 134 additional cities in China crossed the half a million threshold." By 2025, China is expected to add another 107 cities to that group. This rapid increase in the number of cities with sizable population reflects the rapid urbanization of China, whose proportion urban more than doubled from 1980 to 2010 (rising from 19 percent to 47 percent) and is expected to reach 59 percent in 2025," the report said. A press release summarizing the report is available at http://esa.un.org/unpd/wup/doc_press-release.htm. In a new working paper called "The Greenness of China: Household Carbon Dioxide Emissions and Urban Development," researchers rank 74 Chinese cities in terms of their household carbon footprints. The study's authors are Siqi Zheng (Tsinghua University), Rui Wang (UCLA), Edward L. Glaeser (Harvard University), and Matthew E. Kahn (Brookings Institution). According to the study, the "greenest cities" are Huaian, Suqian, Haikou, Nantong, Nanchang, Taizhou, Zhengjiang, Shaoxing, Xining, and Xuzhou. Six of the top 10 cities are from Jiangsu Province, where American Planning Association has established extensive cooperation in terms of training and demonstration projects. APA has also helped to develop urban development strategic plans for three of the top 10 “greenest” Chinese cities: Huaian, Nantong, and Zhenjiang. On December 22, 2009, several members of APA staff and APA China program advisors participated in an expert reviewing session in Yancheng in the final stage of creating the "Strategic Development Plan for the City of Yancheng." 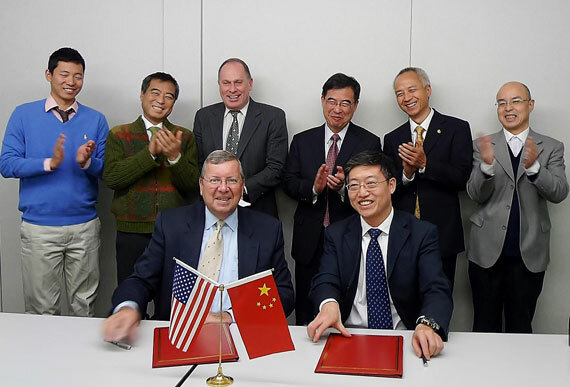 Participants included Jeff Soule, FAICP, director of APA outreach and international programs; Yuan Liu, director of the APA China Program; Chief Advisor Henzhi Sun; Suning Chen, APA China's chief representative in Shanghai; and Research Associate Yuan Fang. The plan puts its focus mainly on environmental issues. Yancheng has the largest natural wetland in eastern Asia, but the city's previous development strategy did not pay much attention to the preservation of this natural resource. This plan suggests using the idea of carbon sink management as way to balance wetland conservation and economic benefits. The plan also emphasizes water quality improvement, smart growth of the city, regional cooperation, and green economy.